Bristol Rhythm & Roots Reunion was awarded two Pinnacles (and shared a third) by the Northeast Tennessee Tourism Association during the annual ceremony held at Meadowview Conference Resort and Convention Center Wednesday, May 9th, 2012. The festival as a whole received the Pinnacle for Special Events in the Cultural Arts Classification. 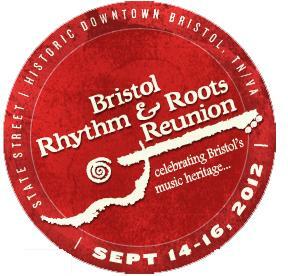 A second trophy was achieved for Multi-Media Advertising & Promotions, Cultural Arts Classification, for their "Stateline" Viral Video released on Bristol Rhythm's YouTube Channel last year (see below). The Southeast Festival and Events Association (SFEA) brings its annual conference to Kingsport's Meadowview Conference Resort & Convention Center, Feb. 20-22. "We are very much looking forward to hosting this year's SFEA Conference in Kingsport, Tennessee as we feel the area offers many unique experiences for the Conference attendees via Kingsport's downtown district, the Planetarium, and nearby Bristol Motor Speedway," said Amy Doherty, Chairman of SFEA, when asked why the Tri-Cities area was selected. 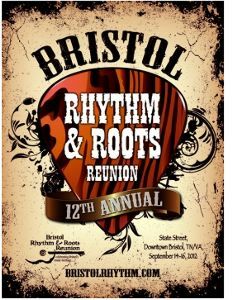 Each year the Bristol Rhythm & Roots Reunion annual poster artwork becomes an item for collectors and festival enthusiasts alike. In fact, the posters are in such high demand that many of them are completely out of print. Renowned artists such as P. Buckley Moss, Charles Vess and April Street have all contributed their talents for the annual poster. You could add your name to this distinguished list by entering your artwork in our BRRR 2012 Annual Poster Art Competition.